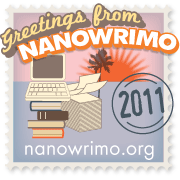 So I did the good thing and contributed to NaNoWriMo (or the organizing group, The office of light and Letters.) I am going to do this and so am moving forward with my planning/thinking. It’s probably fairly obvious that 1700 words a day is not out of this world for me, but keeping the fingers fed with coherent story and words is going to be the trick. We shall see…I still think Elgin’s going to get to go first, but the others all have a corner of my brain…. Fiona MacWallachi stood on the deck of the skyferry and watched the clouds building to the west. The conductor had said they’d make it to Bodwady Bend before the storms came. She really didn’t want to spend another night on the ground watching for young bucks out to get some treaty booty. Particularly Fiona didn’t like the possible option of having to surrender herself as treaty booty, or killing some plains bred teenage idiot who thought all white skin girls were squealing simpletons and easy as well. “Bodawdy Bend fine off the port bow!” called the navigator who’d been forward in the eyes of the skycraft. Fiona moved to look, pulling her looking-glass from its belt pouch. Bringing the brass tube to her eye she quickly found the town, spotting the towering spire of the Sky Father’s prayer house first. The town, spreading along the East bank of the Missippa river was typical of western Aural treaty towns, its streets and lanes organized on a grid pattern, the manufactories to the east, down wind, of the main living areas. There were docks on the river for water craft, and on the bluff the shinning oval of a landing pond. She turned to scan north, picking up the brown and green line that would be the wheeler road that led back to the Sweet Water Sea and the heart of the Aural Republic. Looking down she realized that the lanes of the town spread out into the treaty platt and she could make out the outlines of Aural style farms, though there was a lot of open grass and scrub land as well. On a knob of land to the North she could see a fortified great house, probably the Platt Sheriff’s home. Breathing in a relaxing lungful of cool air Fiona turned and walked back to the second class cabin she had been sharing with a girl coming out to Nanny for the Sheriff’s daughter in law. Half an hour she was standing on the deck holding on to a grasp rail as the skyferry made its approach to the landing pool, like most it was near the center of town and as one could expect for a small, somewhat isolated community a fair number of people had come out to meet the biweekly Post Ferry. Forward she could see bundles of periodicals ready for landing as well as leather sacks with the post offices seal branded every few hand spans to make sure they couldn’t be stolen and reused by enterprising, if dishonest merchants. The tones of the airfans eased, then burped up to a roar, one pushing fore, the other aft, spinning the hull as they slid down out of the sky as the pilot let the charge bleed off the lift spines. In the last instant the hull was aligned with the vector of motion imparted by the wind and the engines. Then the keel chines kissed the water and the hull was shuddering, slowing, the airfans splashed to a stop. The slender hundred and some feet of hull settled into the wather with some groans and creaks, as the wooden planked frame of the hull reacquainting itself with the buoyancy of water rather than the focused lift of the spines. The conductor had done an outstandign job, the skyferry coasted towards the dock with no need for the airfans. The ferrymen and the dockers called out jocular greetings and ran about tossing ropes back and forth, belaying on iron pollards on the dock and hauling, brining the bow to a soft stop and swinging the stern up tight in a few moments. They made it look easy and graceful, but Fiona knew that it was long practice that made it look easy, and layered grace on brute muscle and slightly dangerous work. The gangplank was thrust out from the ferry to land with a thump on the dock, a ferryman, a girl in this case, leapt across with the landing document, meeting a tall redbrown skinned man in the cream buckskins of a Fire Keeper tribal speaker, his feathered head dress said he was a sub chief. The sub chief read the letter, handed to the man next to him, the post master by the long red jacket with the green pipping. The post master read it and nodded, and the two mean, both gave it their chop with their quill pens. Now the postal goods started to come off and the élite and first class passengers and luggage started to flow up the second gangplank. Fiona sat on her duffel and watched this all calmly, she was used to being middle class, she saw it as a major step up from where she had started. More on her memories later…its later than I thought, have to get back to this tomorrow…. This entry was posted in ePublishing and tagged Fantasy, national novel writing month, writing by Sci Fi Engineer. Bookmark the permalink.